SYDNEY, AUSTRALIA: Australian-based heavy lifting tower crane specialists, Marr Contracting Pty Ltd (The Men From Marr’s), have been awarded the contract to deliver specialized heavy lifting crane services on the construction of the 1915 Çanakkale Bridge and Motorway Projectin Turkey. Joint venture project leaders, DLSY Joint Venture awarded the contract to The Men From Marr’s after a competitive tender that saw some of the world’s leading craneage companies submit proposals to be part of the high-profile project. DLSY Joint Venture partners; Daelim (Korea), Limak (Turkey), SK E&C (Korea), and Yapi Merkezi (Turkey) – won the contract in January 2017 to design, construct and operate the EUR 3 billion project for a 16-year period, after which time ownership will be transferred to the Administration, General Directorate of Highways, Ministry of Transportation and Infrastructure of Turkey. The 1915 Çanakkale Bridge which spans the Çanakkale Strait in Çanakkale Province, joins the towns of Gallipoli on the European side of Turkey to Lapseki on the Asian side and is part of the Malkara-Çanakkale Motorway Project – a 88-km segment of motorway planned between Kınalı and Savaştepe that will link several motorways arriving from Thrace and Anatolia at the Canakkale Strait.The bridge is named in honor and remembrance of the World War One that took place between Turkish and Allied forces. 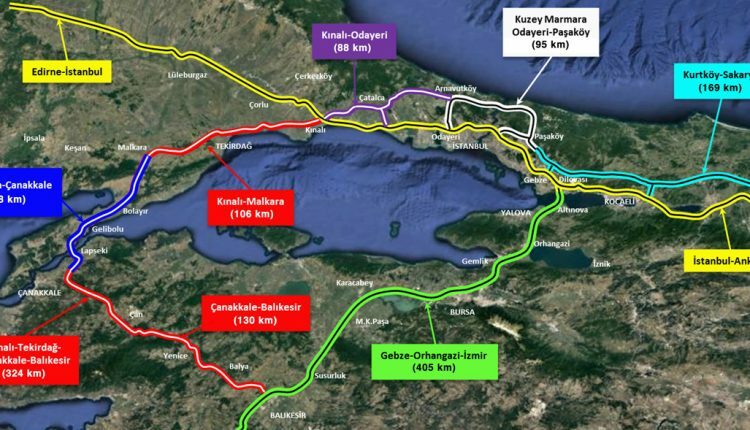 The ambitious Project will play a pivotal role in connecting Western Turkey, providing a new heavy transit alternative to the Istanbul Strait passage that will not only mean faster and more cost-effective freight transport to the region, but strengthened economic potential and social bonds for its population. On completion the 1915 Çanakkale Bridge will be the world’s longest span suspension bridge. With a total bridge length of 4,608 meters, a central span of 2,023 meters and a total bridge tower height of 318 meter, the feats of engineering required to complete the construction are staggering. Impressed by The Men From Marr’s track-record in designing and delivering large scale project lifting solutions on similarly challenging projects in Australia and around the world, DLSY Joint Venture challenged Marr Contracting International Ltd, (a wholly owned subsidiary of Marr Contracting Pty Ltd), to develop a solution that would decrease the construction time and associated risk for the project. The solution developed allowed the DLSY Joint Venture to adopt a refined construction methodology in line with their vision on how the project needed to be constructed. Already with a number of world firsts under their belt, the Marr team worked closely with the DLSY Joint Venture team, to develop a solution that, using the world biggest tower crane – the M2480D Heavy Lift Luffer (HLL), could be a game changer for the future of bridge construction. The Men From Marr’s started work on engineering plans for the Project in January 2018 and are expected to be on site from July 2019 for an estimated 14 months, with responsibility to; design the crane supports and ties, supply the supports ties and cranes, install and commission the cranes, climb and operate the cranes during the construction of the bridge towers and the dismantle of the cranes on completion of the build.